Although I was really keen to give the powder room a new look when we moved in, I didn’t want to spend any money. Maybe it’s because it’s one of the last temporary, budget-friendly makeovers we tackled, but by the time we got to it, I was just really done spending money on anything impermanent. I’ve been anxious and sweaty about spending money on some impending, more permanent updates and I didn’t want to divert funds, I guess. In my penny-pinching efforts, the half bath was spruced up with leftover white wall paint, leftover grey cabinet paint, leftover tile paint, leftover everything, and then we hung up some art we already owned. I didn’t really put much thought into it beyond, “paint the oak,” and “white walls, white walls, white walls”. The towel ring was another generous blog freebie (that I picked out). I did spring for a new curtain rod, though, because I wanted both bedrooms and both bathrooms to have the same style (there’s no curtain yet, though). The result? Perhaps unsurprisingly, although I’m much happier since the painting mayhem, it’s still not a room that I loooovvve. Maybe because it’s a smaller room, or maybe because it’s beside the cheery laundry room and across from the even brighter kitchen, but I just don’t love the grey cabinets in here – even though I really like the grey in the main bathroom. Although I’m still in penny pinching mode (especially because we’ve started comparison shopping for the main bath reno – yikes! ), I have decided to make one little change, even if it means opening up the old wallet: I’m thinking about re-painting the cabinets. It’s a quick fix and I think a more dramatic or cheery colour will make me happier. I don’t want to paint/cover the counter because all of the solutions seem dusty and I actually don’t mind the colour (strangely). But I am open to painting the tile again (and am wondering if just painting it the same white as the walls, but in a semi-gloss, could be a simple solution?). 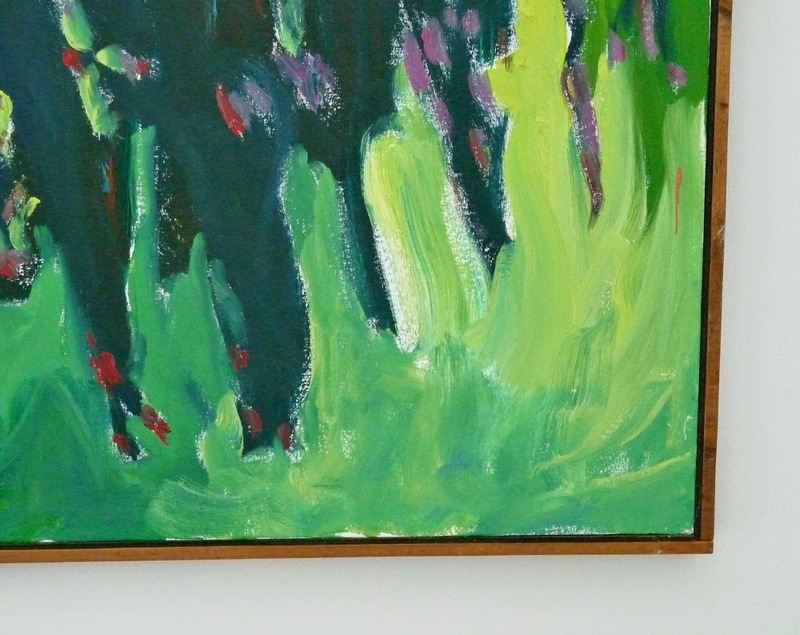 I like the green abstract (by Hubby’s grandpa) that is currently in the bathroom, but I’m not opposed to moving it elsewhere. I also have a cool, sentimental ballerina print (in need of a more modern frame) and a collection of silhouettes, both without walls to call their own, so I can easily switch up the art, if need be. Thoughts? Here are the options again: Darker grey? White? Teal? Navy? 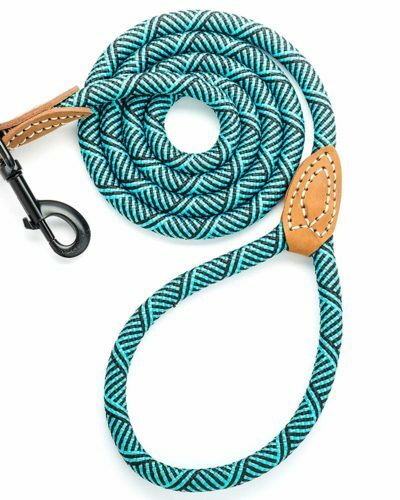 Turquoise (nudge, nudge)? 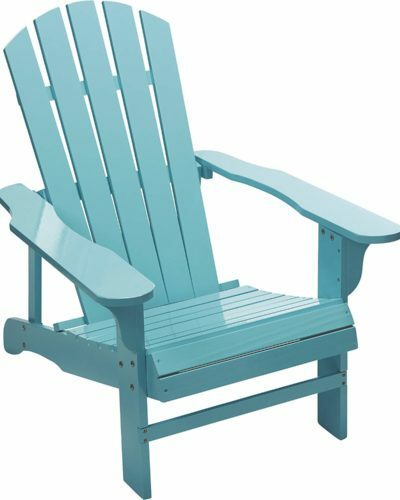 Pale Turquoise? Apple Green? Mint Green? Grey Green? Leave it as-is? Other ideas? Lay them on me! Half baths seem to be my Waterloo – I’m always fiddling with them, never content. Growing up we didn’t have a powder room, so maybe this whole “guest half bathroom” concept is still foreign to me. Or maybe it’s the tiny scale? Smaller rooms are trickier. Thank you to American Standard for providing me the Speed Connect Times Square Monoblock faucet. I was not otherwise compensated nor was I encouraged to provide any sort of positive review. In fact, I’m quite peeved because this shiny new faucet was the ultimate catalyst for my dissatisfaction with the room 😉 It was a snap to install (minutes!) and we didn’t have to use any caulk or putty, as promised (the Speed Connect faucets are said to be the easiest and fastest to install). gorgeous painting – I almost see navy blue in it (am I wrong?). Have you considered going with navy for the cabinet? add in some shiny chrome hardware on the doors (maybe a more modern bar pull). I'm a huge fan of herringbone and chevrons – if you could find (or paint) one with beige, white, navy and aqua it would be gorgeous and would help unify the space colour wise.. when looking at pictures its had to tell the exact tone of the colour of your counters – not sure if navy would work in that regard.I've seen a lot of pins on Pinterest lately where people have painted their linoleum floors – is this something that you've looked into? 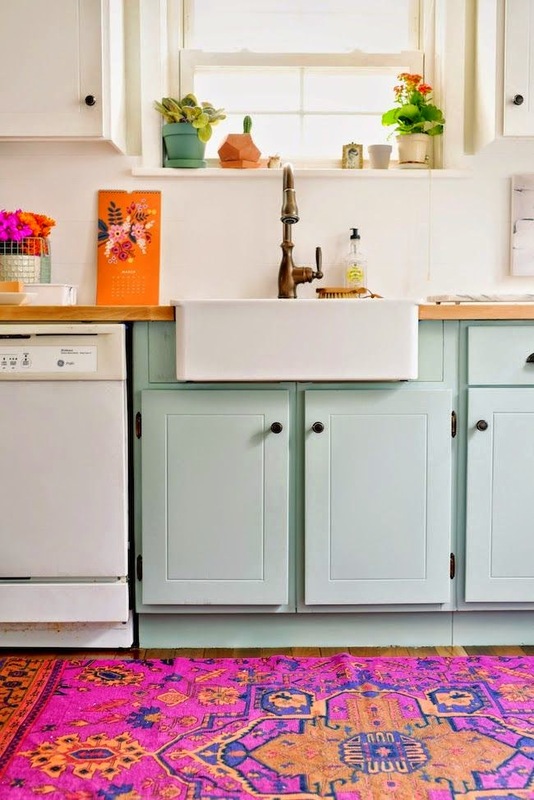 you could always liven things up with a bold colour on the floor? not sure how they stand up to wear (especially in a bathroom) but it might be something to look into if its just a temporary fix you are looking for. I don't think there's navy in the painting – it's more a teal – but it's so heavily layered it's entirely possible I'm wrong. I did consider navy, but worried it's too dark? Definitely a contender, though, and it's nice to hear someone else suggest it. I do like the idea of new pulls – I even have two silver ones left over from the kitchen (don't know how I ended up with extras! ).Oh, I love herringbone! 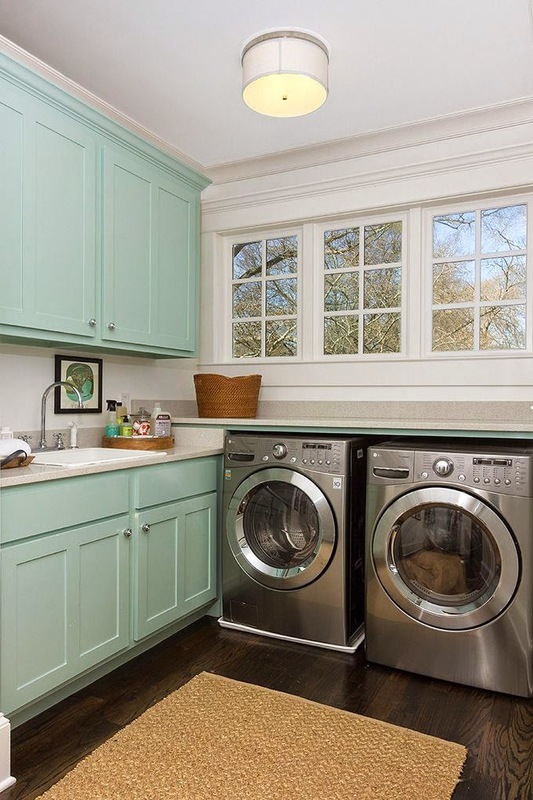 It's such a pretty pattern – that's a great idea.You know, I've thought about painting the flooring but it extends through to the laundry room, entryway and kitchen so it's a big job. Szuka is also phenomenally good at scratching up the hardwood floors and I don't imagine a paint job would withstand her vigor. But I like the idea and might try it in our weird little storage room at the other end of the house because it has vinyl flooring too, but sees very little traffic. What's that saying about great minds…? Lol. 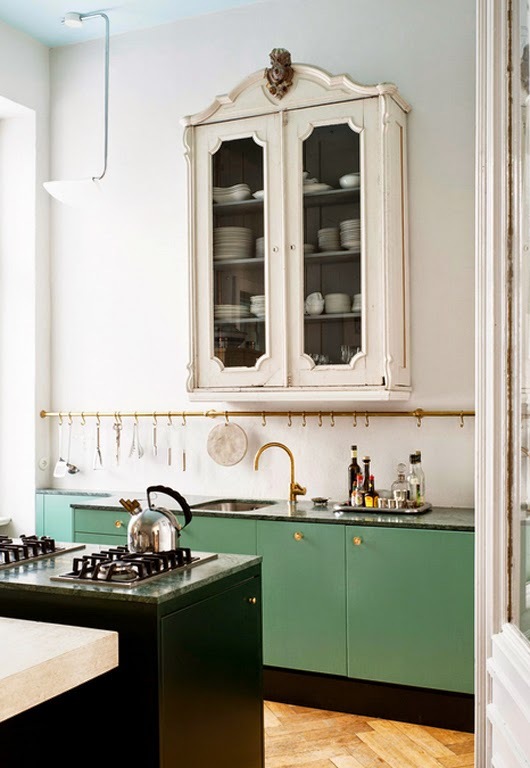 I have seen so many pretty mint and green cabinets floating around that I'm seriously tempted! Embrace the current colors. Accent with a wonderful fluffy gray or green hand towel and ditch the boring beige one. Find or create some mirrored vases, or curio boxes to complement the new faucet. 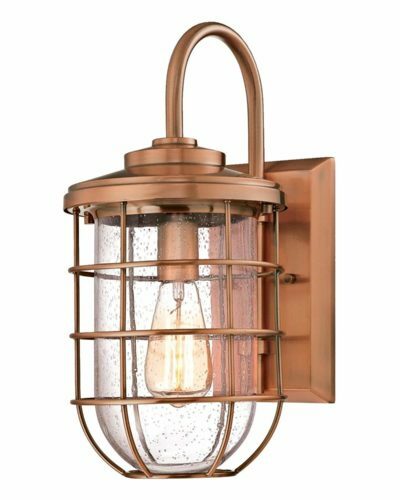 I would also repaint the light fixture with green or gray in the same or complementing shade. I think these few changes would make a world of difference. Hmmm, I do like the idea of less work, haha. Thanks for the awesome suggestions! I'm torn between the light mint and the turquoise mixed with white. I like the darker colors, but they make the space look too small. Trim the mirror and paint it too. Good luck. Team turquoise! Lol. You know, people suggested trimming out the mirror in the main bath but there's no space below it and it's slated for reno anyway so I sort of filed the idea into the back of my brain and didn't even consider it for this bathroom! But there's lots of room around it and it's definitely sticking around longer. I should definitely do that! Thanks so much for the idea. I'm having such a "duh" moment right now. Leave it. I don't like any of the other options as well as what you already have. The tile compliments the sink, and the room is soothing. Just a note on painting the tile: I painted the tile backsplash in our kitchen (before we replaced it) with regular latex paint and it held up surprisingly well for more than a year. That's good to know! I loved the Rustoleum stuff I used, but I really goofed the application and so it didn't turn out as planned. 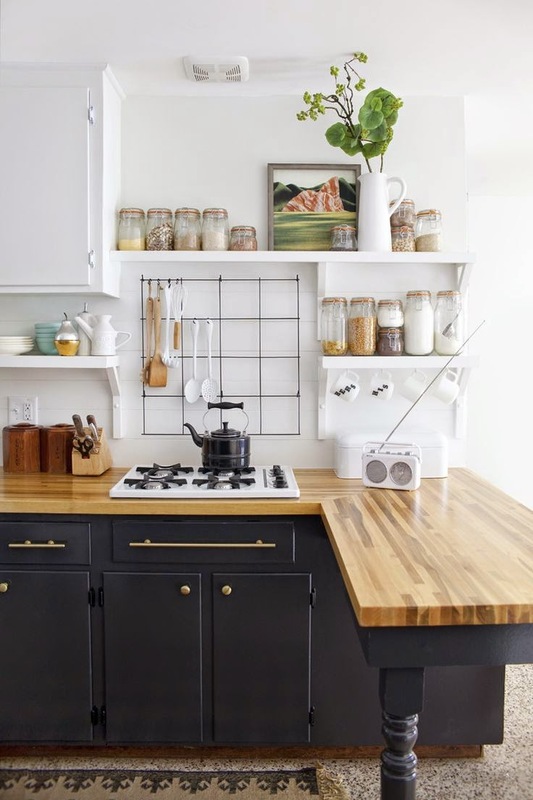 I think a coat of white would be a good choice – and it's not used often so I think it should hold up really well, especially if your kitchen tile did. Thanks for the tip! 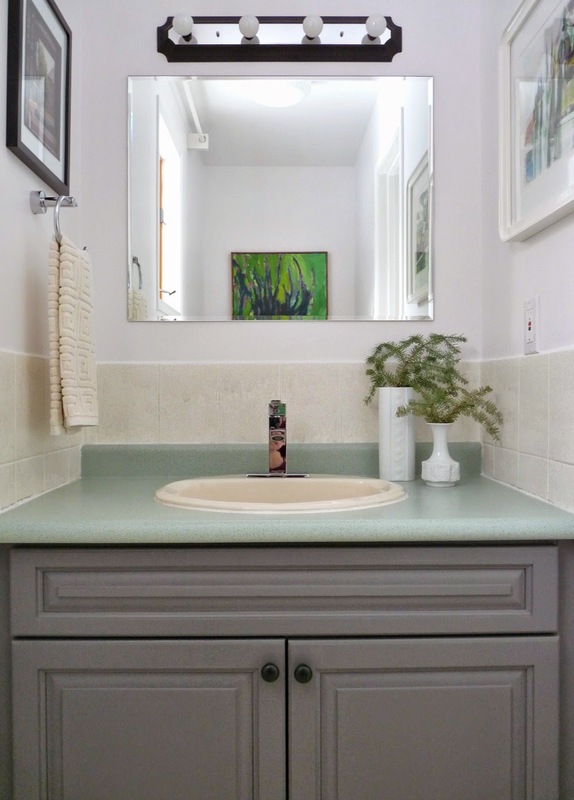 Its the sink that throws it off, the boring beige- but do you fix the sink by hopefully finding one cheap and live with the rest until you can renovate it they way you want? 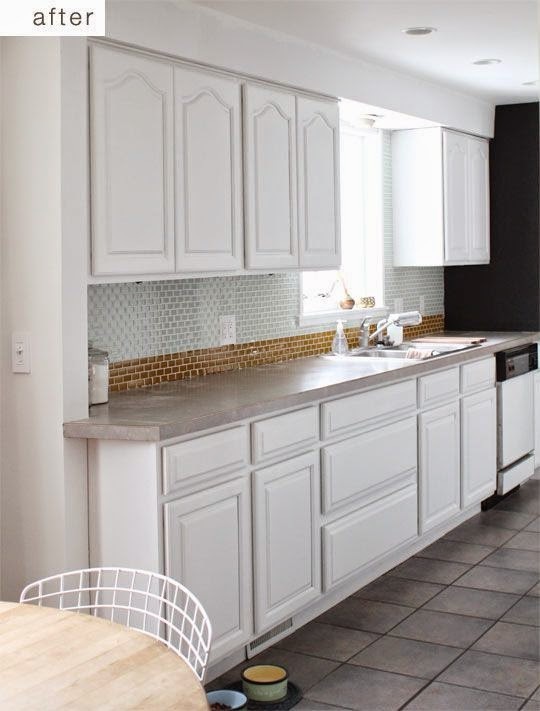 I like the grey cabinets, I would maybe paint the tiles white to blend in with the wall. good luck! The sink is AWFUL! But, at least it matches the equally awful beige toilet. I don't have the cash right now to replace both of them and I think just having a white sink might look off, if the toilet is still bisque? We did replace our sink in the townhouse and left the toilet, but I think it worked because we chose a glass sink that was totally different: http://dans-le-townhouse.blogspot.ca/2013/07/half-bath-makeover-blah-beige-to.htmlI'll keep my eyes peeled for a really awesome deal, but I think it might be outside my budget right now. 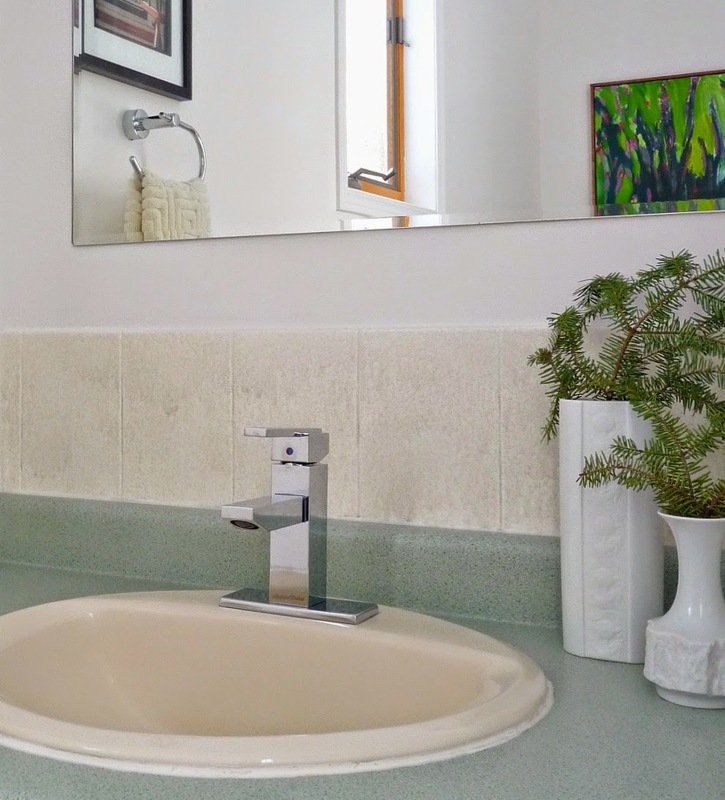 And if I swapped out the sink, I'd really end up wanting to swap out the counter and soon enough I'll have demo'd the room, lol.But I do like the idea of painting the tiles white. And it's interesting to get another vote for the grey. Maybe I should put away my paintbrush for a minute, lol. I love all of the options you presented, but I think the dark grey would coordinate the best with all of the other elements that are already in the room. Dark grey and beige, dark grey and mint, dark grey and green, dark grey and chrome, dark grey and white… all awesome combos and nothing would look out of place. 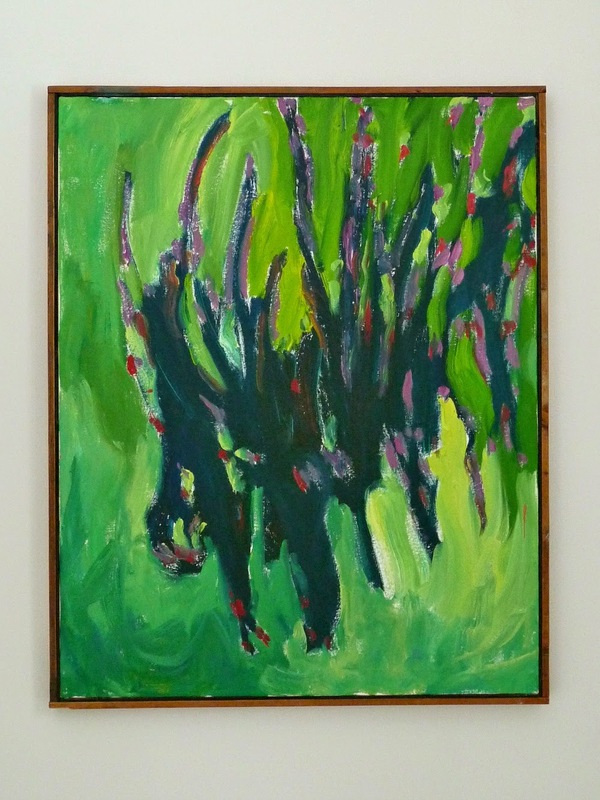 It would also add visual weight to that side of the room to balance out the visual weight of the green painting (which is pretty heavy visually… in a good way). I really like the grey color of the cabinet but I think navy would work better with the mint green countertop. Id also want to change the sink b/c beige in a bathroom just drives me a little nuts but I can understand not wanting to spring for it. Maybe something more exciting in the mirror area so it takes your eye away from the fixtures? The beige definitely drives me nuts! If I weren't totally gutting this space in a few years, I would definitely spring for a new counter and sink (and toilet) because the cabinet is pretty inoffensive. Why, or why, was beige so popular? I'd honestly love any other colour – I could even work with purple, lol.Good idea about the mirror. Someone suggested framing it out and I think that could be the answer!That navy kitchen by Emily Henderson has me seriously swooning over navy! Personally, I'd go with the purple in the painting. 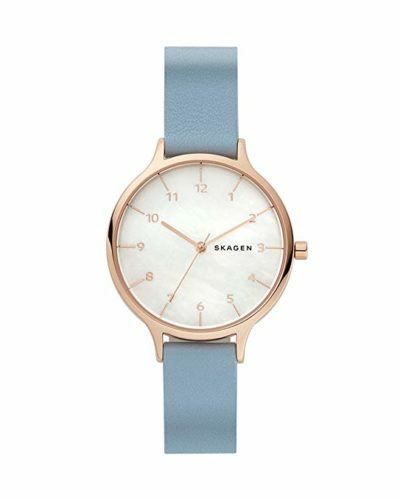 It won't clash so hard with the beige, and it will work with the mint. It's fun and funky color, too! i vote for the mint hues! Although I LOVE the navy…i just think it would not work with the bisque hues either! Another vote for mint! 🙂 Isn't it a bummer when you love something but it just doesn't "go"? If I had white in there, I'd definitely be thinking navy or teal – no contest. Totally understand your frustration over the bisque sink, and your reluctance to have mismatching sink and toilet. I once had a basement apartment with a harvest gold toilet and avocado green sink – so things could be worse! 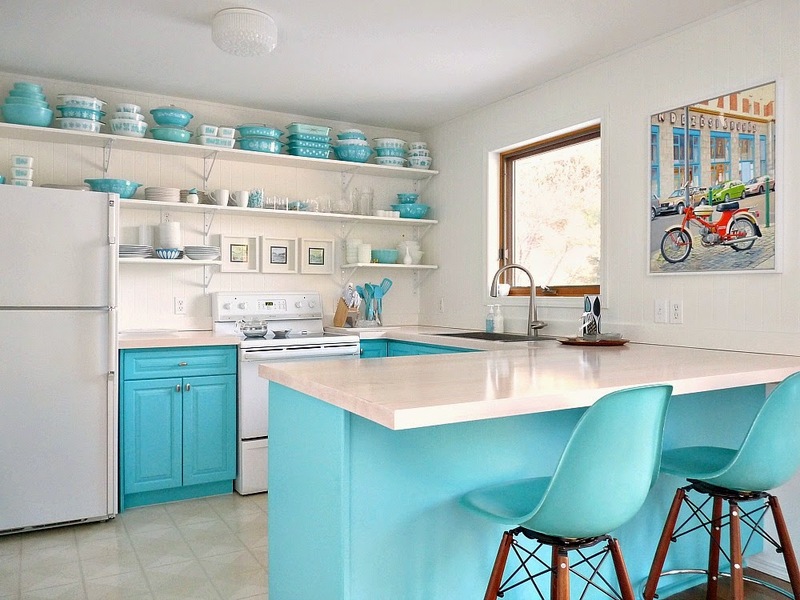 ;)I vote for a mint that is close to the countertop colour – lively and fresh and would give a cohesive look. 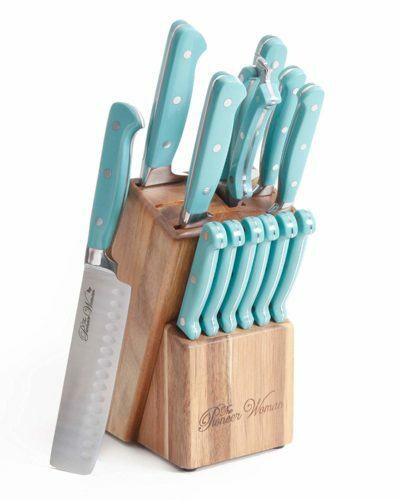 Here is a bit of a departure…how about white and then bring in the teal/aqua colour with glass knobs that bring in the counter colour. Won't be s moody as your other terrific suggestions. Good luck! I know that whatever you choose, it will be awesome. White would be fresh! Even with the beige, you think? Love your idea for coloured knows!! Well, you know, Canuck and all!!! Lol. Yes, even with the beige but I'm not sure how much of a contrast it would be with the other side and your painting with its more dramatic, intense colour. Best of luck! I actually like the grey cabinet, it's modern to me. I think the tile should be painted same white as the walls to make it blend. I think a copy cat of your kitchen counter would look awesome in there on the grey….and if you have left over material from the counter top, bonus. You might be able to find a free or cheap white sink on Craigs List in the construction or free category. I always see things like tiles, drywall, faucets, etc etc. 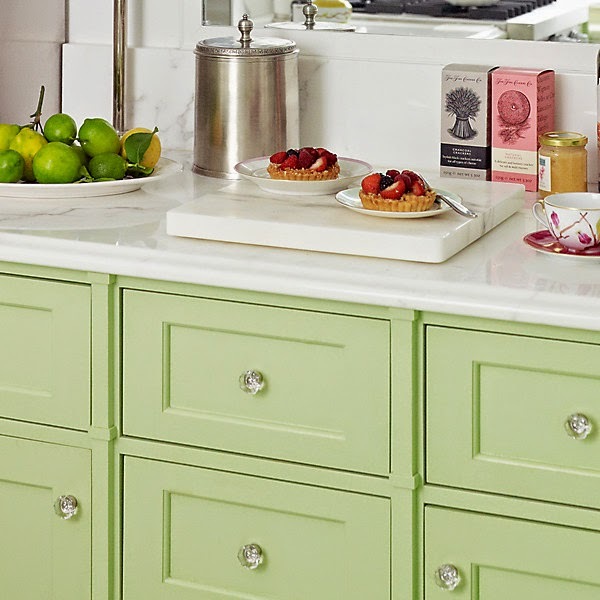 And maybe if you want to bring in a pop of color you can do Jadeite green or the minty green (like in the pic of the kitchen with the orange art on the counter) frame around the mirror to finish it. Gosh I don't know, I am bad at interior decorating lol. You're very good at this!! I would replace the counter if it wasn't a snowball job. First the counter, then tile, then sink, then toilet. It's all getting ripped out eventually. I will keep my eyes peeled and focused on the free category. Lol. You never know!! Agreed! Thanks for the feedback. I definitely appreciate it. Anything can be worked around! I just need the right combo 🙂 The sink and counter are too expensive to replace right now. Hi, Tanya. So great to see everyone's ideas! I haven't read carefully, so maybe someone else has already mentioned this, but… My first step would be to get some off-white/beige/almond (whatever it's called) caulking to match the sink and redo the bead around the base of the sink. That will make it look less dirty white. 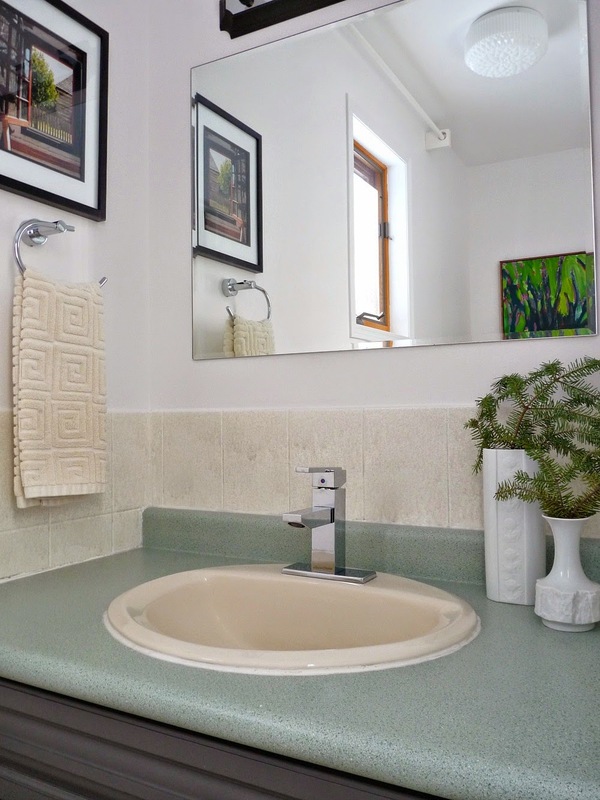 Likewise, I would move those white vases somewhere else, as they just underscore the fact that the sink isn't white. Maybe a couple of objects in colors from that wonderful painting (wow! don't move that out!) would pull things together. 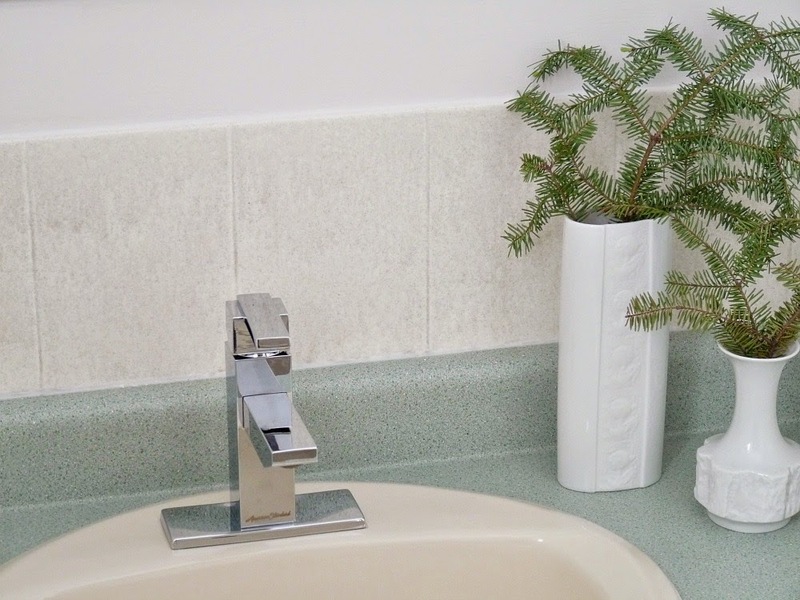 If you make the off-white sink the "whitest" object in the room, it will look brighter. 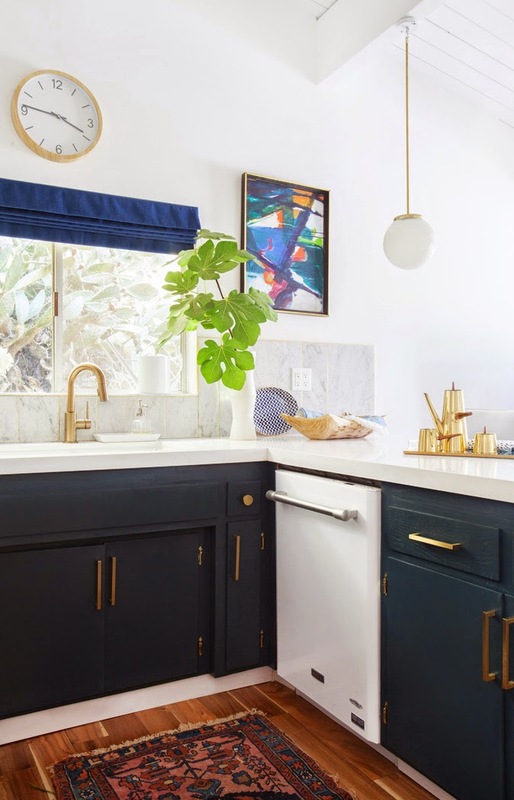 I find that I'm agreeing with the people who say make the base cabinets a darker color to balance out with the painting, but I might change my mind once you got matching caulking and different accessories on the cabinet. Oh, and I think maybe redo the black behind the light fixture? Either chrome to match the fixture, or??? 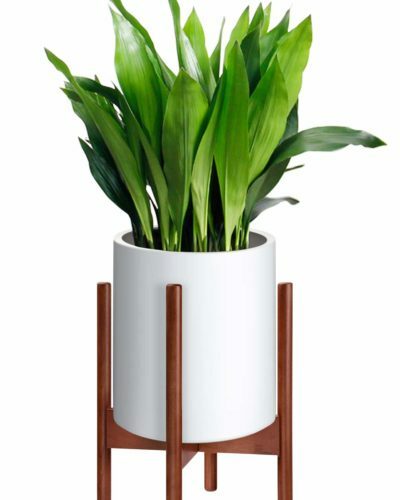 Something that complements other objects in the room? It looks to me as if you've got a great start, but just need a very few tweaks to get things in harmony. Looking forward to seeing what you do! Well, that was dumb! The wall are white, of course, so they are the whitest things in the room. Sorry. What I *meant* was, make the sink the lightest thing in the sink-and-counter-top-and-backsplash area. Agh! I really like the idea of painting the tiles white (so they blend in with the walls) and then maybe a light green/ minty green for the counter? this way it would look intentional and coordinate with the counter top and also still work with the beautiful painting without it being too stark of a statement in such a small room… good luck! I definitely think the tiles need to be white, you're right! You put words to what I was trying to explain: the painting is stark! Yes! I think color on the vanity will help it tie in. I agree with this. I'd take out everything white from that bathroom (including picture mats) and build up from the bisque. Without the white for comparison the bisque will read better, and then you can pick a color that matches or complements the countertop for the vanity and maybe something cool on the walls like stripes to distract from the fixtures? 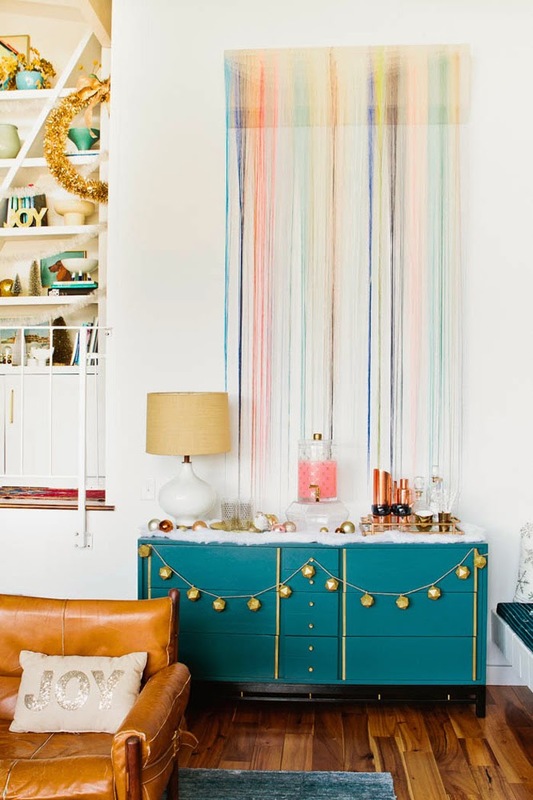 Even though it is a small room you really can go as bold as you want. 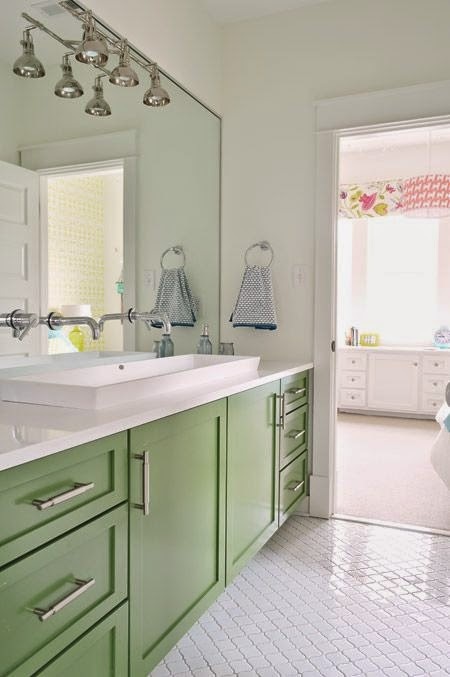 I love to do bold colors in powder rooms. I have one of the smallest powder rooms ever and it is a dark terra cotta color on the walls with a small walnut pedestal for a vessel sink that is a strong color too. I agree with one of the above comments that the white walls are too stark in this room and conflicting with the bisque fixtures. Go bold! Have fun. What if you painted the entire vanity lilac? (Tile, vanity and countertop). It would be seen as one piece instead of different colored components in a very small space. 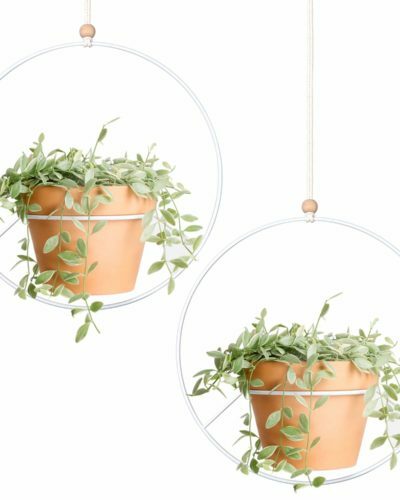 Then maybe a new light fixture? You could always carry the lilac up the entire alcove wall/behind mirror to ceiling. I LOVE your idea of painting everything the sale colour – I think that could look very cool. Hmmmm, something to noodle on! Thanks for the great ideas! Why not get rid of the tile surround? If it isn't necessary structurally, and I can't imagine that it is, removing it would go a long way towards modernizing the space. Yes, I don't think it serves much of a purpose. But our drywall skills could never create a perfect match between new and old and, sadly, the tile in the kitchen was super glued and the wall came down with it. I could, however, remove the tile, replace the drywall and then install a simple white subway tile. That would make the tile less prominent but now create an issue of drywall seams and whatnot. Honestly, if it were me I would leave the cabinet, I think it looks fine. But replace the sink and counter top. 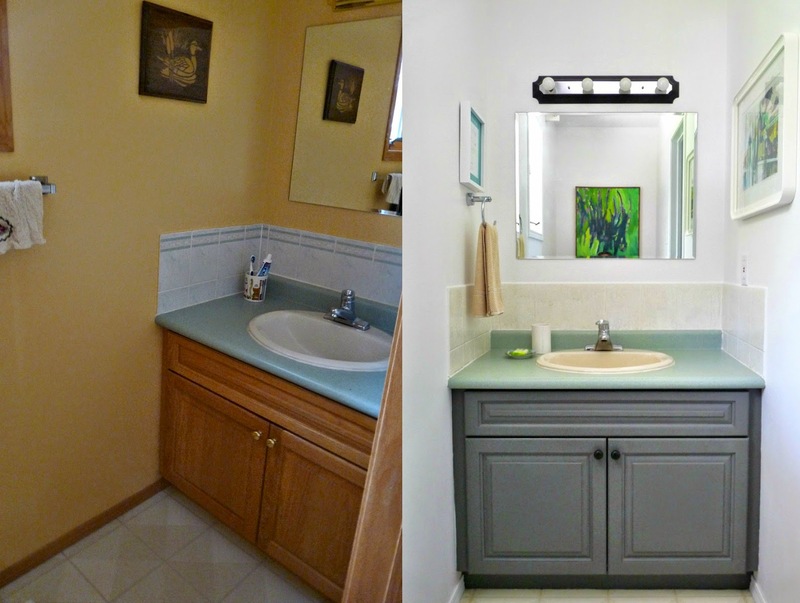 In our master bath I painted the existing vanity but replaced the sink and counter top, and the whole thing looks brand new! My only hesitation with replacing the sink and counter is that then the toilet won't match (it's beige too). And I'm gutting this room at some point, so it seems a shame to get all new fixtures. But maybe I should think a bit about it. Perhaps a bath fixtures sale will call my name! My first thought was a dark blue violet, something like Benjamin Moore's Dark Lilac. Ooo, that's a really gorgeous colour! It's got a really pretty, kind of moody feel. I think the beige toilet would look out of place and it seems a shame because we're ripping it all out in a few years. But it's a good idea so I will see if I can find a good sale! Not ruling anything out.